Published 5th February 2015 by Chicken House books. What’s right – and who’s wrong? Someone’s always to blame. From debut author, Jeannie Waudby, comes a nail-biting contemporary drama set in a modern society divided by violence, prejudice and distrust. 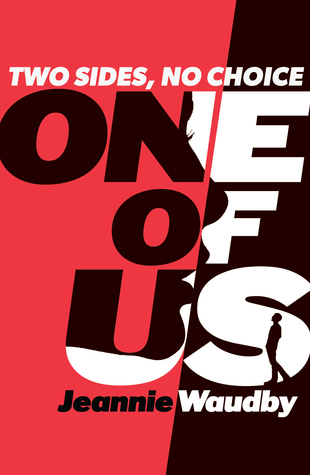 One of Us is a topical YA thriller about young love and religious intolerance – can one isolated girl learn to understand who she is and where she stands in such a world. My Review: I was eagerly anticipating reading One Of Us, and I really enjoyed it, despite taking so long to finish it due to exam revision! One Of Us is a gripping début. It’s the story of K Child, an orphaned teenager who is asked by an officer, who saves her from a bomb attack, to go undercover in a Brotherhood school to uncover a terrorist group. K’s city is divided between the citizens and the Brotherhood, who are a religious minority that aren’t tolerated because of past terrorist events. The plot swept me up from the first pages, where K is on the train to school when a bomb explodes and her life is turned upside down. I’ve had to spend a lot of time on school-work lately, but otherwise I’m pretty sure I wouldn’t have put the book down at all! K develops a lot throughout the story and I grew to really like her, as she navigated a Brotherhood society and had to question everything she’d been told all her life. I’m not too sure on how I felt about the love story that grew in One Of Us, though I’m sure other readers will adore it. I think the only thing I would’ve changed about the book was the ending. There’s a lot to take in, in the last fifty pages, and that plot twists was completely unexpected – but I wished the truth K uncovered was explained more. 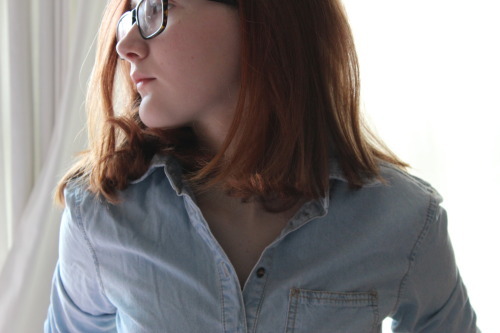 It was really shocking and I would have loved to read more about the story she finds. Overall, One Of Us was a really riveting read; the kind of book you want to read in one go – I was drawn in from the first pages (and then reluctantly pulled away because revision meh). There were a few things I’m still mulling over, but I really recommend it if you’re a fan of hard-hitting, contemporary thrillers like Malorie Blackman’s Noughts and Crosses! I received a copy of One Of Us from the publisher, in exchange for a review. In no way at all did this affect my thoughts. This entry was posted in Uncategorized and tagged 2015 release, book review, chicken house, contemporary, debut novel, jeannie waudby, one of us, prejudice, race, religion, thrillerr on March 9, 2015 by keithbwalters.